Isn’t it mind-blowing that a teeny, tiny seed can grow into a spectacular, productive, healthy, delicious plant to nourish you, your family, and your friends? At the end of the day, that’s probably the biggest miracle underlying food production. We think so, which is why we’re excited about this new video Start Seeds Indoors. We are honored to be featured by a new Colorado company, Hatch Lab. 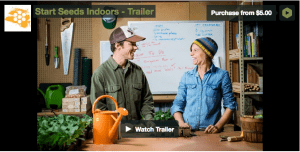 Hatch Lab produces 30 minute videos on homesteading topics, and they featured The Urban Farm Co. in a 30-minute video that gives you all the information you need to get started with your own seeds. 1. It can save you money. Although there’s an up-front investment, once you have the basic equipment, starting your plants from seed is a huge money saver. In our video, we estimate it will cost you about $15 to grow 32 plants; if you bought those same veggies from the grocery store or farmers’ market, they’d cost closer to $80. That’s more than 80% savings. 2. It allows you to grow much more food. First, starting veggies from seed indoors extends the growing season, which allows you to produce more food. Second, if you start your plants indoors throughout the growing season, you’ll have mature seedlings waiting in the wings when you’ve ravenously consumed your outside plants. In other words, you’ll rarely have a day without a garden-fresh salad. 3. It’ll help you connect. When you grow your own veggies, you reconnect with nature and get a front-row seat to the wonders of life. Plus, research shows that growing your own food can improve your mood. You know exactly where the seeds came from, the environment in which the plants grew, how they were treated, and how they were harvested. You get to watch in awe as the seed germinates and grows from its humble beginnings. It feels good to eat food you know so well; it’s tastier, healthier, and better for the environment. 4. You’re making change. When you grow your plants from seed, you’re wresting a little bit of control from large agricultural and consumer product companies, and you’re taking a stand for small-scale agriculture, self-sufficiency, and local eating. Your homegrown veggies require less energy to produce and no packaging for transportation. The small and thoughtful act of growing your food is empowering and important. Ready to give seed starting a try? You can see the class preview and download the step-by-step PDF to get a sense of the process and a list of all the supplies and equipment you’ll need. Let us know how it goes!